Seasons Greetings everyone! I managed to pack in two recent movies over my long holiday break. Things are pretty hectic on my stay-cation so i'll make these short and sweet. 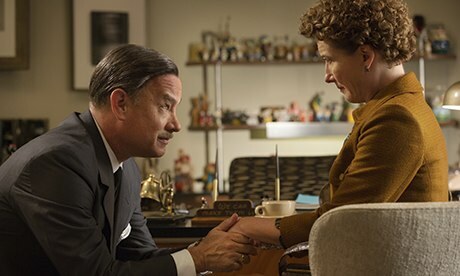 Saving Mr. Banks tells the story of Walt Disney and his plight to get the film rights to Mary Poppins. Disney (Tom Hanks) must get the approval of P.L. Travers (Emma Thompson), an Australian author who wrote the classic novel. The story of brining Poppins to the big screen is very interesting and engaging and Director dadd dasdas does a solid job of mixing flashback footage (featuring Colin Farrell as Travers' alcoholic father) with the events of the 1960's that include a trip to Disneyland and several planning/production meetings. This movie would be pretty bland if it wasn't for Hanks' and Thompson's performances. Thompson plays Travers as sort of an eccentric and grumpy Debbie Downer and should be up for an Oscar once again. Hanks delivers his second quality performance of the year as Disney. He personifies the legendary character and really is the only person who could have been properly cast in the role. The back story of getting a Disney classic to the big screen proves to be one of the more interesting movies of the year and I recommend it to everyone. Thor: The Dark World is the sequel to the 2011 Thor film by Kenneth Branagh in which all the main characters are back for an entertaining mix of action and humor. Chris Hemsworth once again wields the hammer well as Thor and comes across as an actor who feels very comfortable in this role (his third performance if you count The Avengers). Natalie Portman (returning with an Oscar statue in her possession) reprises her role as scientist Jane Foster, the love interest for Thor. Loki (the always excellent Tom Hiddleston) is back as well and weasels his way into action towards the end of the film despite being imprisoned at the start (he did pretty much blow up NYC last summer). The sequel is able to get off the ground quicker than the first film as we don't need the character origin stories any longer. There's a lot of action throughout and the visual effects are far superior than the first film. Hemsworth's chemistry with both Portman and Hiddleston shines and makes the audience more engaged. The lack of a real threatening villain is the only downfall here. The Dark Elves and their magical weapon (the Aether) seem to be menacing enough but just didn't feel like a true adversary for Thor and Asgard. The twist ending is a solid and unexpected one and sets up an interesting setting for the third Thor film. Worth a watch in the theater for sure (although it's almost vanished from them). Both of these movies were very good but not amongst the upper echelon of movies I've seen this year. 4 JR's each for Saving Mr. Banks and Thor 2. I'm hoping to get in a cluster of movies next weekend with American Hustle and Wolf of Wall Street.. I've heard bad things about Anchorman 2 so I think I'll wait for video on that one. Hope everyone had a good Christmas and Best Wishes for a Happy 2014!